Not exactly, but America's Team has indeed found a new address ... for its headquarters. A couple of house-hunting Cowboys were told by the club this summer that buying a new home in the booming Collin County city might be a shrewd logistical investment. According to a team source Frisco is the leading candidate and likely city to host the team's new facility, while Arlington and Irving have dwindled out of the conversation. 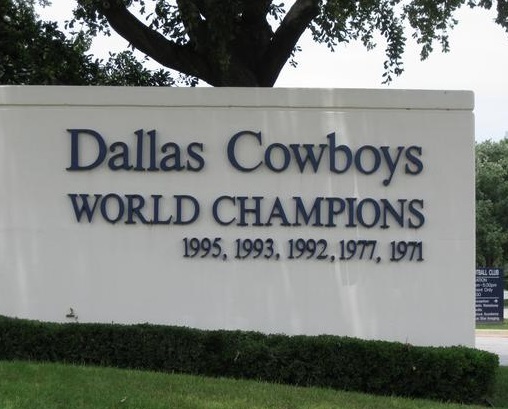 The Cowboys will stay at Valley Ranch through at least the 2013 and 2014 seasons, but are apparently anxious to upgrade from the place off MacArthur Boulevard they've called home the last 28 years. While Arlington has the space to build a practice facility near Cowboys Stadium and Irving wishes to retain the team it's hosted since 1971 (at Texas Stadium and Valley Ranch), Frisco is rolling out the red carpet in the sprawling, growing real estate along State Highway 121. Already home to FC Dallas Stadium, the Dallas Stars' headquarters, Texas Legends' D-League basketball and Dr Pepper Ballpark (home of the Rangers' Double-AA affiliate RoughRiders), Frisco also boasts prime locations along the North Dallas Tollway. Along with Collin-County neighbor McKinney, Frisco was named as America's fastest-growing city in 2012. For years after their 1960 inception the Cowboys headquartered on Forest Lane off Central Expressway in Dallas, then moved to Valley Ranch in north Irving in 1985. Though it remains functional, owner Jerry Jones desires a state-of-the-art place to match his stadium. The Cowboys will likely build a facility with all the amenities Valley Ranch lacks, led by an indoor practice field and an in-house, full-service restaurant. Until then, they'll be the team with the billion-dollar stadium and the broken-down offices. Jerry Jones purchased a bunch of land at Dallas North Tollway and 380. Could this be the new Valley Ranch? Frisco is in both Denton and Collin County - not Collin County only. Jerry's land at DNT and 380 is going to be a new regional mall. Dear Lord baby Jesus, lyin' there in your ghost manger, just lookin' at your Baby Einstein developmental videos,learnin' 'bout shapes and colors, please don't let my tax dollars go to finance this bunk. McKinney is super gay. Which is why Richie lives there. dont think old location was forest and central, but a little farther south on central and ??? The Dallas Cowboys facilities before 1985 were split with offices at 6116 N Central Expwy. and the practice facility located at Forest Lane and Abrams Road.